Winter in the first photo where Jesus is dead, and spring after his resurrection? Are the flowers in second picture meant to represent different countries? Each ribbon is 2 different colours e.g red and white for Poland? Yes although I wouldn`t call it winter, rather forlorn barren land. And then a new life began. As for the next pic, ribbons are not important. Hint - what is behind the flowers? Next hint - check the date. The writing's too small for me to see, however there's an obvious Warsaw connection. Maybe Maf is right and it's something to do with Smolensk, it's the 2 year anniversary as such, but if it is, it seems odd that you've tagged it onto riddles about Easter. Maybe Maf is right and it's to do with Smolensk, but if it is, it seems odd that you've tagged it onto riddles about Easter. Yes, Maf is very close, now say what is under the wreaths. BTW, when I wrote :Another riddle I didn`t mean the continuation of the Easter series. Another means a different category, doesn`t it? :):) Sorry for misleading you. Ironside guessed correctly but his post contained off-topic stuff and was Randomised. He wrote: Obviously its the Wawel and President's LK place of eternal rest. Hence flowers and ribbons. Let`s add that not only President Lech Kaczyński is buried in the tomb placed in one of Wawel Castle`s underground crypts but also his wife, Maria Kaczyńska. She was a good woman. They both died in the 2010 Polish Air Force One`s crash in Smoleńsk, Russia. Good eye for details, I didn`t read "Prezydenta", these inscriptions seemed so indiscernible. Sth else instead: what does it symbolise? Yes, I think we can officially close the first season of riddles. Each season lasts two months. I have loaded over 60 photos concerning Polish history, lifestyle, food, culture etc. Only a few haven`t been guessed, some are still waiting for a lucky guesser. One riddle has been provided by Dougpol. Looking through your answers, I counted full guesses and halves too. Who made it to the podium in the first season? 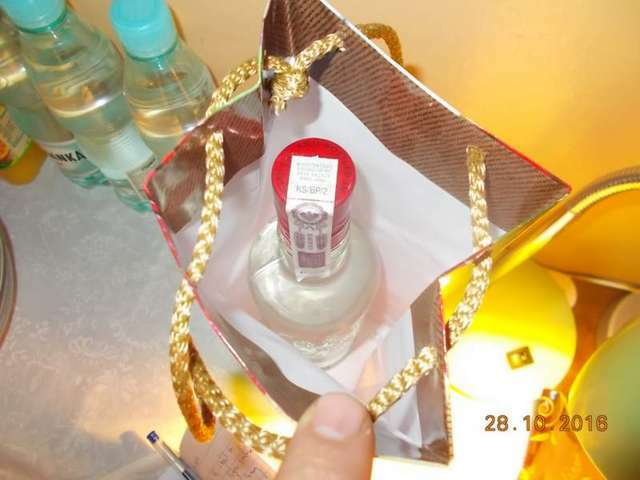 First prize - Chemikiem - 20 correct guesses. I can provide the exact results for anybody who wants but on your request only. Congratulations to all winners who know a great deal about Poland as well as thanks to all participants for your persistent attendance and wonderful intellectual effort. Let`s say the new season has been started with the plane picture above. The prizes, a seperate one for each winner, is this stuff which also makes another riddle - what is it exactly? In light of you owning a nuclear fallout farm, I was going to say it was a prepper's bottle of liquid potassium iodide for radiation exposure. But that would be too little too late at this point. Therefore, my answer is Sobieski. This would makes sense too given your station in life as a high school teacher. The tragedy of what happened to the Polish Jews of Kraków? Departure of those sent to the concentration camps? 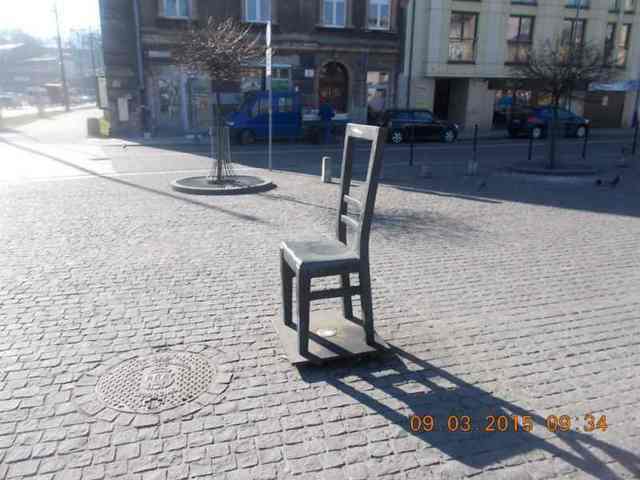 Those chairs are a memorial to those imprisoned and who died in the Kraków Ghetto and the death camps. Those chairs are in Plac Bohaterów Getta. How about dropping in more often? There are a few unsolved riddles, check the posts above. The tragedy of what happened to the Polish Jews of Kraków? Yes, it symbolises piles of furniture which was left on the square .after Krakow Jews had been deported to death camps. What is this riddle about? Actually, not. The plane is connected with the history of Poland so anybody who is really good at it should guess correctly. Without more of a clue, I won't get this, it just looks to be a diamond pheasant ( Lady Amherst's pheasant ) in a cage. Probably at the zoo. It is in the Polish Aviation Museum in Kraków. It is and at the same time it isn`t. How is it possible? It was displayed at the Pet Fair, not the zoo. It might be a little clue. Another clue - focus on my quote above - diamond pheasant. 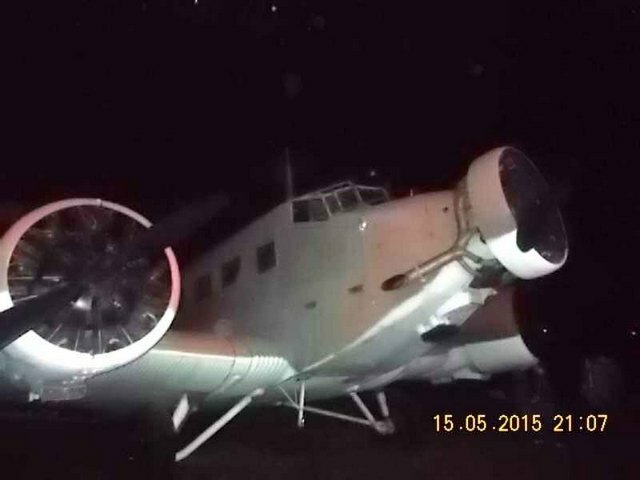 Is a Junkers Ju-52/3m g10e in the Polish Aviation Museum in Kraków. Yes! Now, what part in the Polish history did it play? The part which also belongs to the history of the construction. It is and at the same time it isn`t. Is it some type of hybrid/cross breed? what part in the Polish history did it play? It was used in the bombing of Warsaw during the invasion of Poland. The plane is a bomber version of the Junkers Ju 52/3m and had been fitted with two bomb bays. 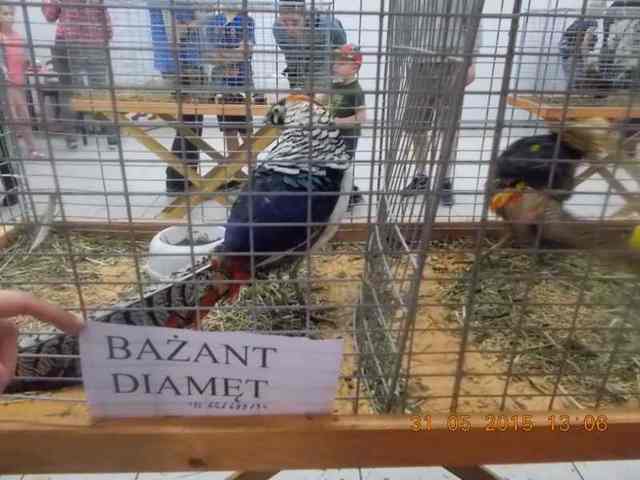 No, it isn`t a hybrid, it is a pure diamond pheasant but there is sth wrong with it anyway. But don`t look for minute details! The riddle is perfectly visible. Yes, the plane was used as a bomber to drop incendiary bombs on Warsaw, the indomitable city, in 1939.
it is a pure diamond pheasant but there is sth wrong with it anyway. It can't spell? Who made the sign? Someone who knows a lot about barzanty? 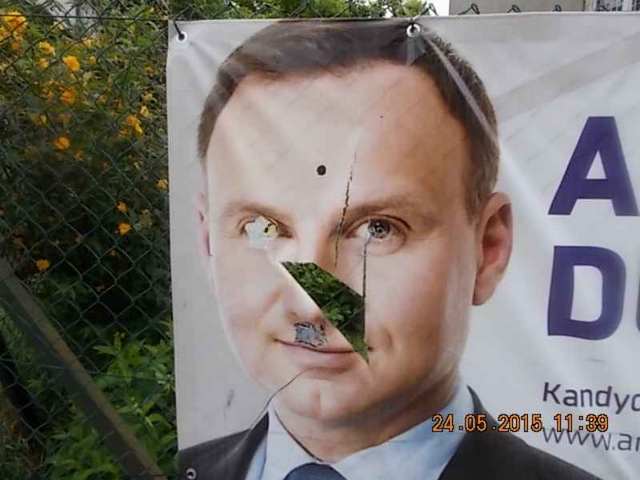 Not everyone was happy with Duda being elected president? A PO voter suffering from DDS (Duda Derangement Syndrome). - Vandalism permits powerless individuals to strike out against the institutions which control them and to take charge of the situation themselves, arousing fear in others and raising their own self-esteem. Interesting how the photo was taken on 24 May 2015. Duda was still an MEP and would assume the office of president only three months later on 6 August 2015.